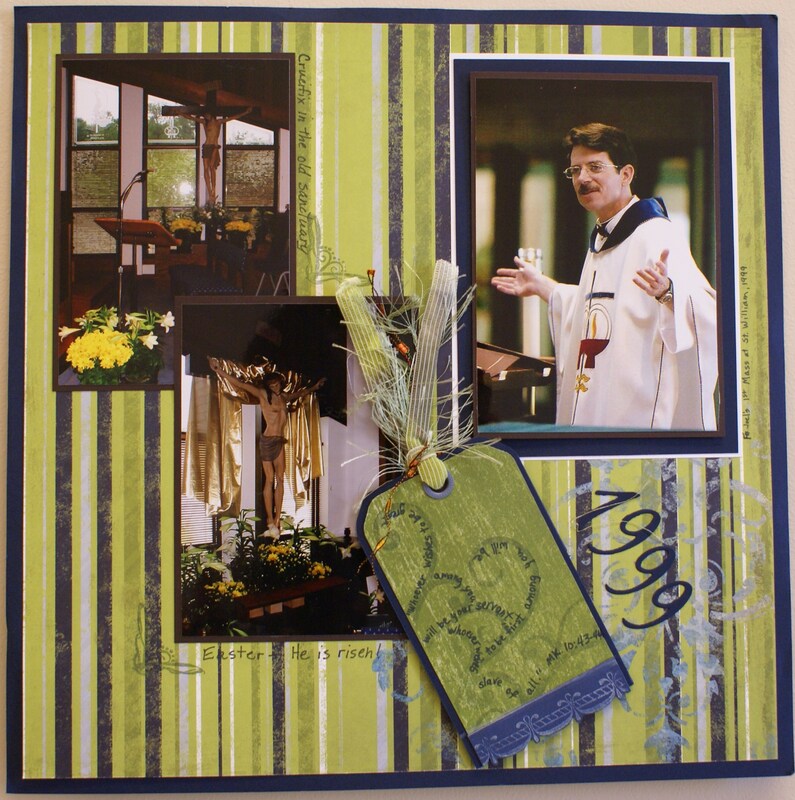 Rock, Paper, Scissors | Remembering with pictures through the eyes of faith . . .
No one likes war. 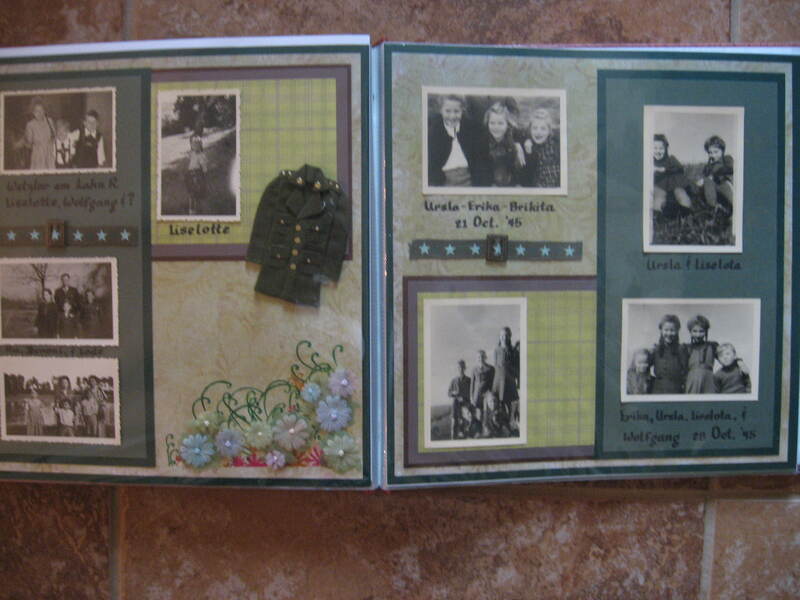 My dad was born during WWI and survived as a member of the US Army in WWII Germany. He is 94 years old as of this month and has rarely spoken of his experiences – especially about the liberation of the concentration camps. Although it was not one of the major death camps, the horrors were just as real in the smaller camps. He took pictures of mass graves and when he did talk to me about the war, it was because I was reading about WWII Germany and the concentration camps. He would say that pictures only capture part of the war. You can’t capture the smell of death that lingered in the air. 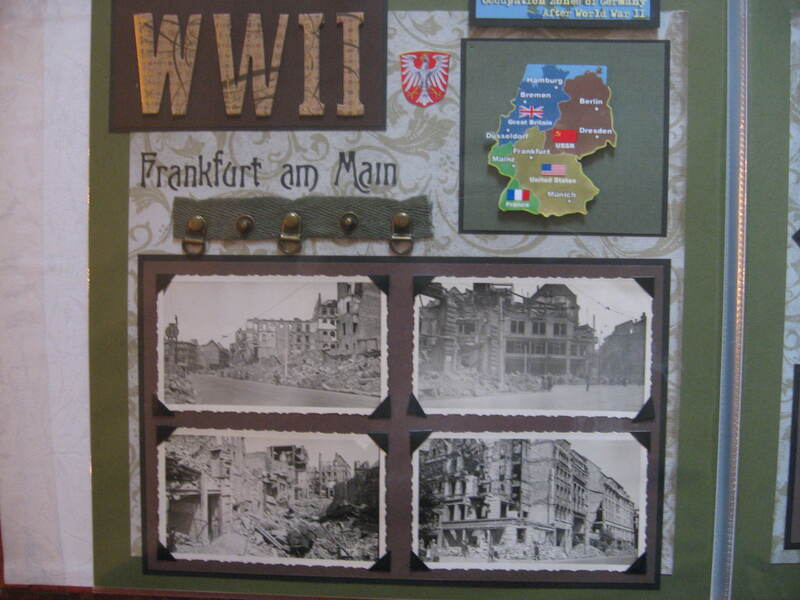 I first scrapbooked his photos of the destruction of the city of Frankfurt. I spent the night in Frankfurt last November following a trip to the Holy Land. Because of flight problems, Lufthansa put us up at the Sheraton hotel at the airport. It is all very modern and the hospitality was wonderful but the scars of war can last for generations. My dad took these pictures in 1945 of the destruction in Frankfurt as his unit made its way through the city. Not much was left of St. Bartholomew Cathedral. Devastation was widespread. 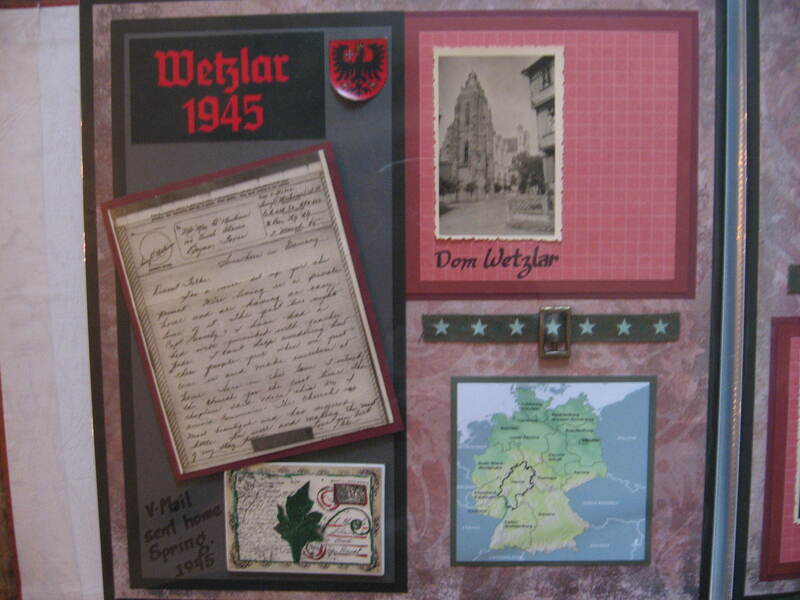 His unit headed to the little town of Wetzlar where he spent several months. There, he made friends with a number of German children. They followed him everywhere and called him the Pied Piper. 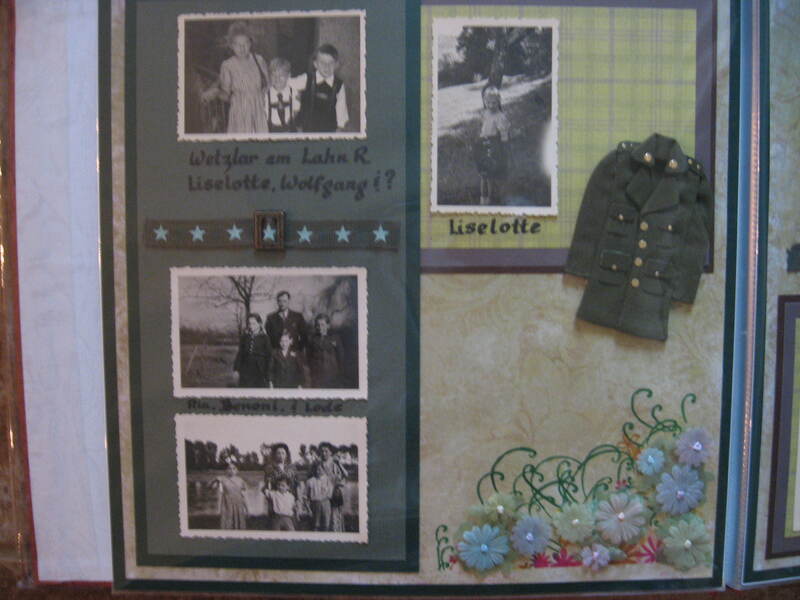 From Wetzlar, he wrote a v-mail home to family. A landmark in Wetzlar was the bleistift or pencil. It was actually a tower that looked like a pencil, thus the name. After over 60 years, my dad still remembered the names of most of the children. He told of a birthday party where the cake was very bland. Sugar was a scarcity at the end of the war. At the end of the party, the elder brother comes walking in. He had been taken prisoner after the war and had just been released. My dad’s back was to the door, but he turned around to see the man when the children began to snicker and giggle. Most of the photos taken with his camera were of the children, but there is one of him at the foot of Bleistift taken by a young girl named Liselotte. Then there was the man who was struggling to provide for his family during the war. My mom said that she used to send clothes that my oldest sister had outgrown for their little girl who was just a little younger. As my sister outgrew clothes, my mom would mail them to this family. 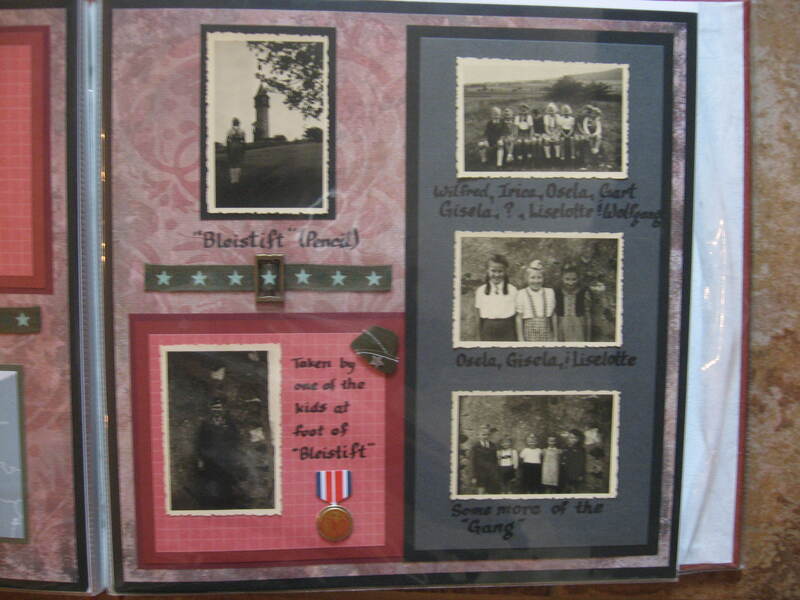 My dad lived with this particular family and had a number of stories to tell about the time he was there. I also learned about two other towns my dad visited. 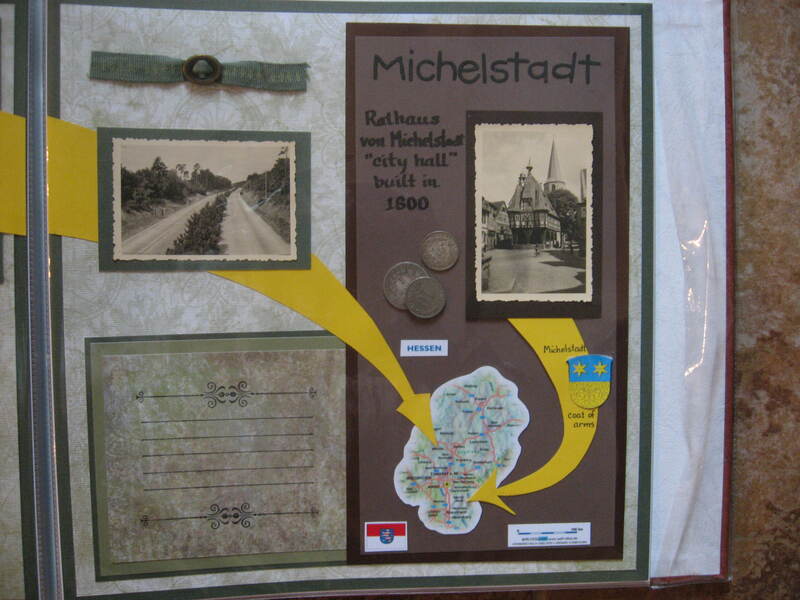 One was Michelstadt, far south of Frankfurt. The other was Braunfels, just a short distance from Wetzlar. In Braunfels was a castle that he visited while on leave. 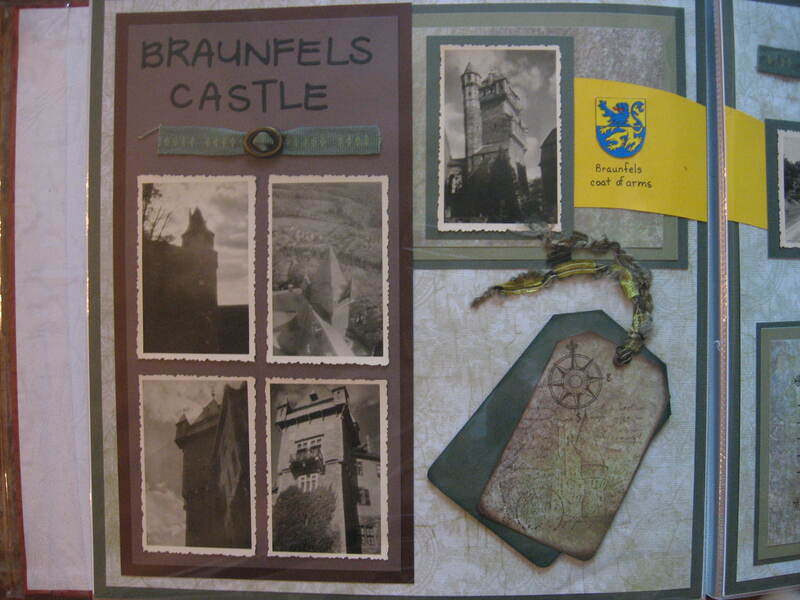 New Braunfels, TX – south of Austin and north of San Antonio – was actually founded by the Braunfels family who lived in this castle. Daddy finally returned home in 1946. He had done his part to bring about justice for those imprisoned in the death camps. 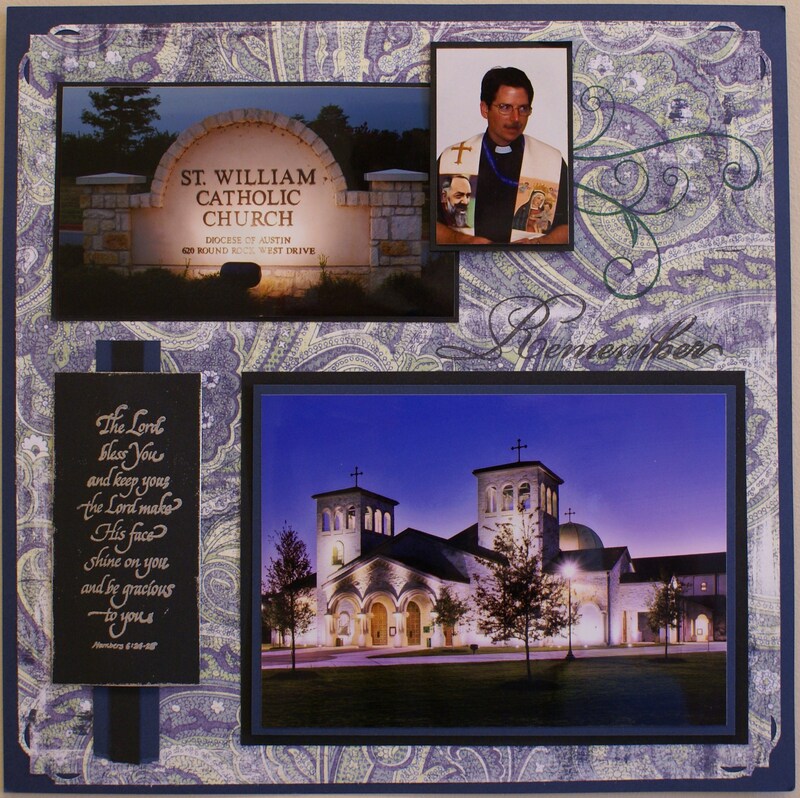 The paper you use for any layout is important to the end result of your faith/scrapbooking. 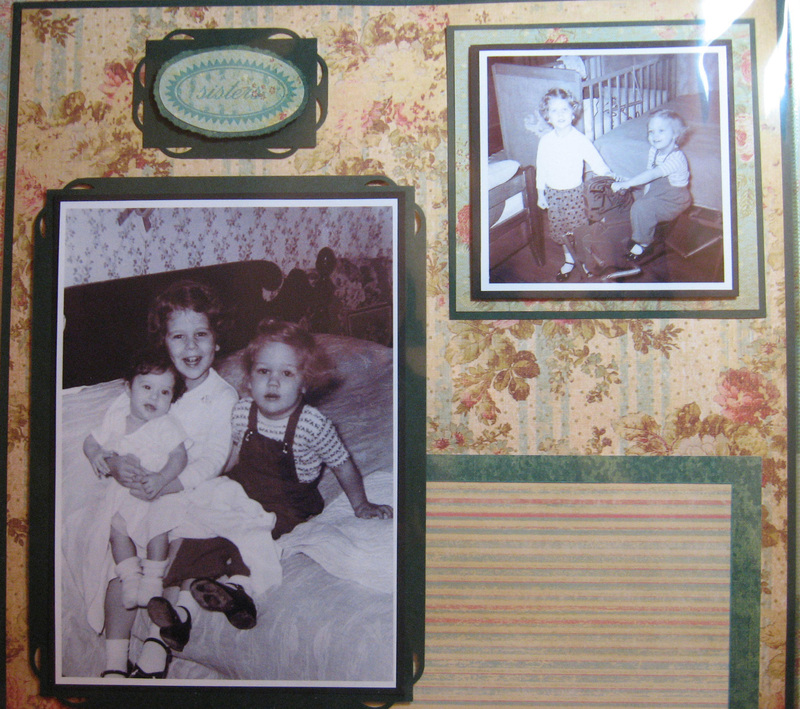 A great example is this layout I made of me and my two sisters sitting on our mom and dad’s bed. 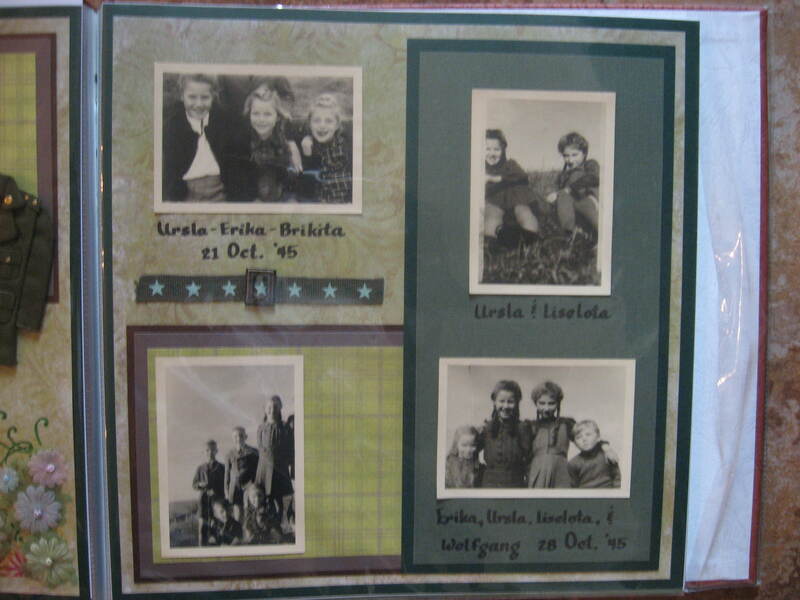 The pictures are, of course, black and white, so subtle colors had to be used in the layout. 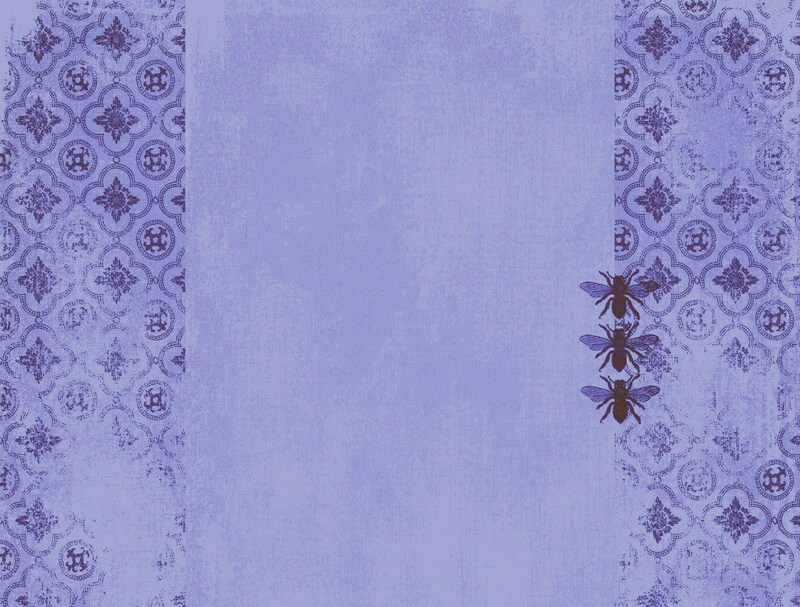 Look closely at the wallpaper in the photo and you will see that it is almost identical to the background paper in the layout. My parent’s bedroom had wallpaper that was a lattice of roses – minus the vertical stripes in this paper. A dark paper behind the print makes it “pop” so that it isn’t just some ordinary page. 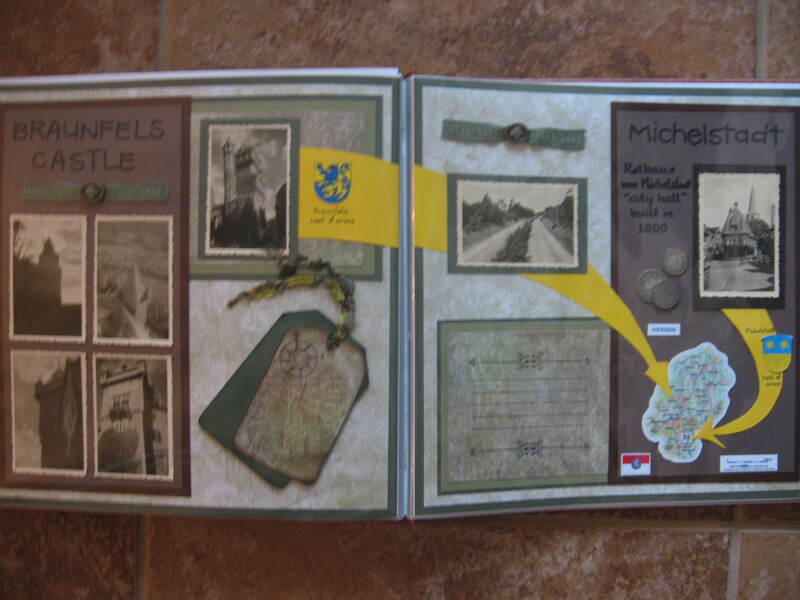 I just love making a page “POP”! Although I haven’t journaled on the layout yet, I’ve left plenty of space on the striped paper. 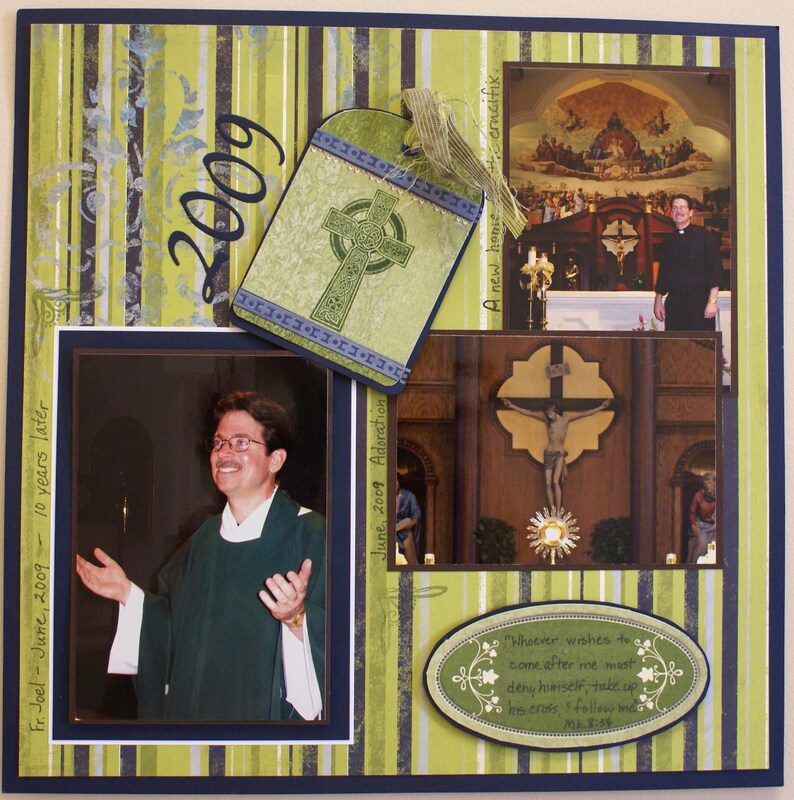 The second page has the Prayer of St. Francis of Assisi, which I somehow remember being on the wall or next to the bed. This statement of Jesus would of course include sisters, not just brothers. We are all called to hear the word of God and keep it and by doing so, we will surely be blessed – for keeping God’s word is doing His will. Although my blood relationships with my sisters are important, I must remember that my relationship with God is more important. I have a special affinity for bees and honey. 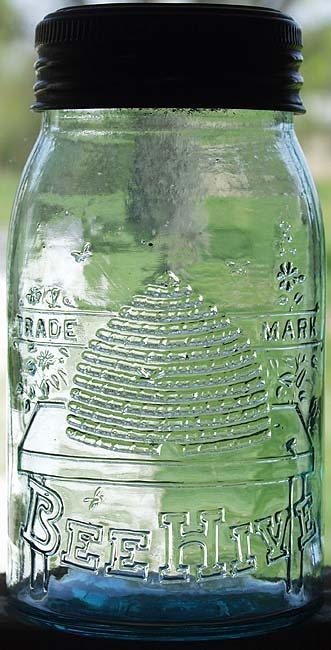 My dad kept a hive when I was little and sold his honey locally. My gardening table area in the garage is a tribute to those years. I have parts of the wood hive that I’m using for shelves. On the shelves I have his smoker, a jar with a honey label with his name on it, and other various and sundry bee-related paraphernalia of his and things I’ve collected over the last4 years. When I made this blog, I looked for a background that would be appropriate and I finally found it. 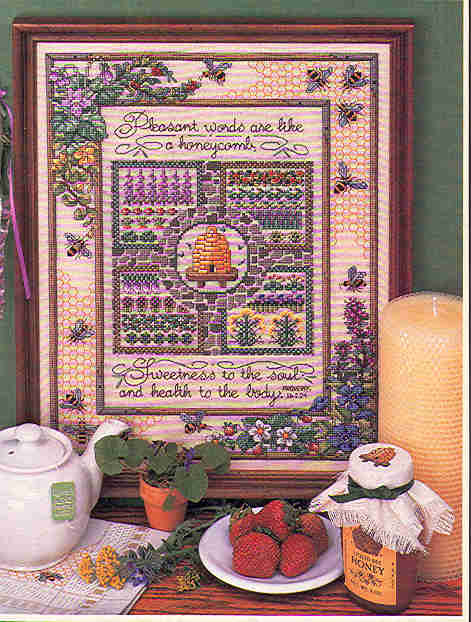 I thought it was a fun idea to add a background that included bees, yet looked almost like scrapbook paper. I found this free background on the internet and uploaded it to my blog. The three bees are a reference to my dad, but also coincidentally represent the Trinity and the Word of God. …the fear of the LORD is clean, enduring for ever; the ordinances of the LORD are true, and righteous altogether. More to be desired are they than gold, even much fine gold; sweeter also than honey and drippings of the honeycomb. How often does our tongue – through our own words – become an instrument of evil. It is so easy to fall into gossip, criticism, blame, . . . and other speech that stings others and makes us less holy. At such times, our actions do not reflect the Word of God which is always sweet. 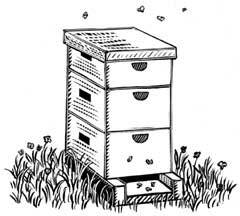 Although I haven’t put the story of my dad’s bee-keeping in a faithbook, it lends to the medium. I just had to share the story about how I found my blog background and its significance. 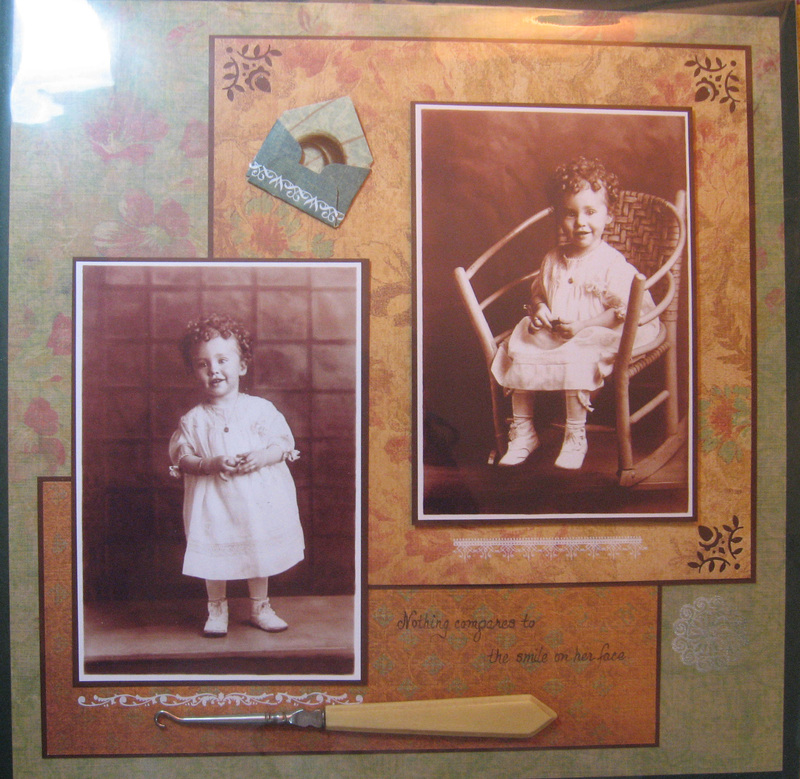 When you are scrapbooking, a lot of it is about the paper you use. It makes all the difference in the world to have the right paper. A while back, I decided to FB (Faithbook not Facebook) some of my favorite photos of my mom when she was a little girl. 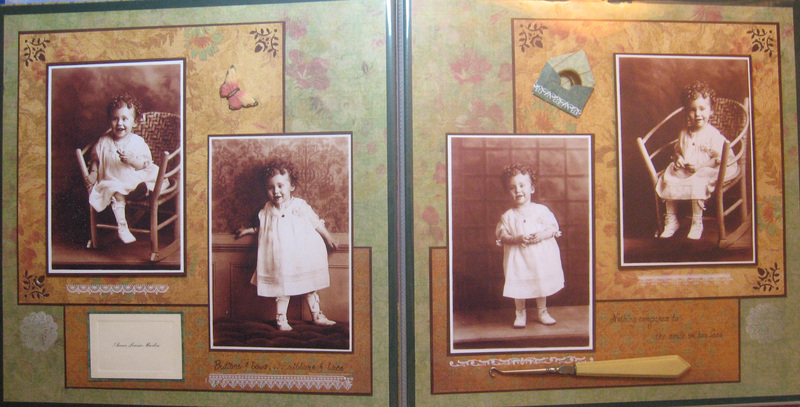 My mom was probably only a year old in these photos. She had the most luscious crown of golden curls you could find and a toothy little grin to match. 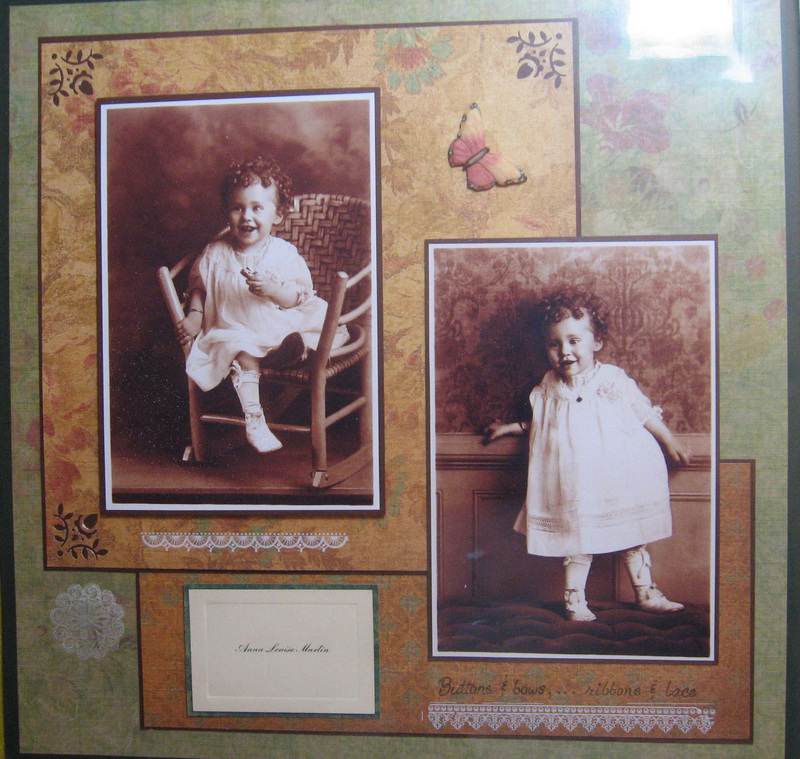 The pictures reminded me of the buttons and bows, ribbons and lace, so typical of little girls – especially in the early 1900s. This is the layout I made. 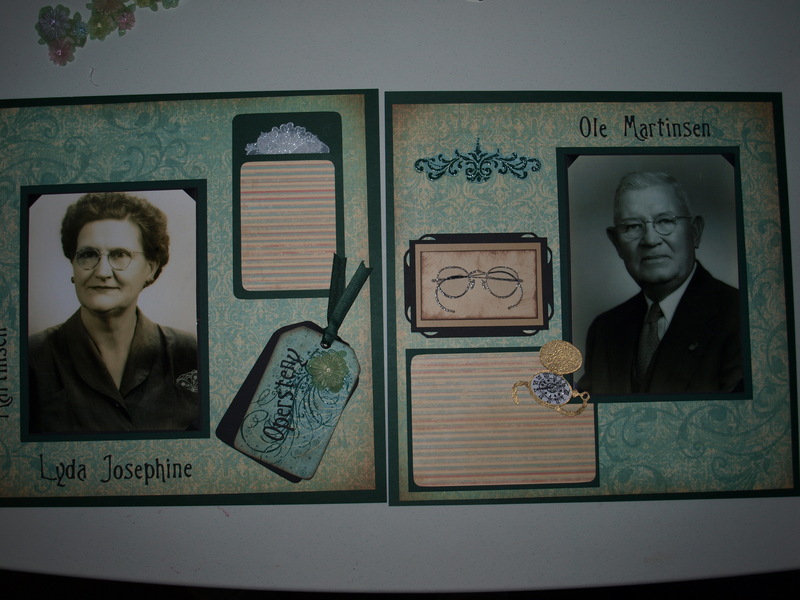 I loved the sepia tones of the brown patterned papers And because there was a little bit of green in them, I accented with the green floral paper as the background. The layout includes a lock of her hair and an ivory-handled button hook that could have been the one used to get her ready for this photo session. Here is the first page. My mom loves butterflies so I added the butterfly. It adds a sense of beauty and grace. 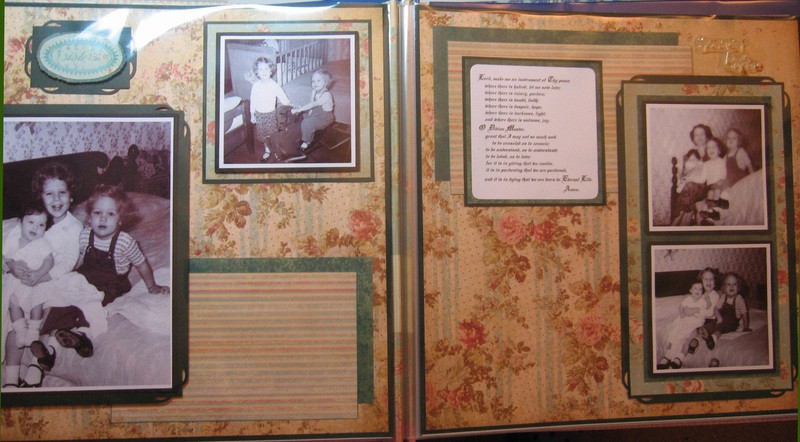 I found some rub-on lace when making this page and it was a perfect fit. As I was working on this layout, I was also going through the old children’s clothing I inherited from my mom not long before. I discovered that I had a very similar version of this little dress. Not too long afterward, I went to my sister’s house in Dallas and sure enough, in her office, was hanging this exact dress with the little tatted medallions above the rows of lace across the bottom. She had no idea that this was the same dress in the pictures until I let her know. I showed her the tatted medallions in the photos. 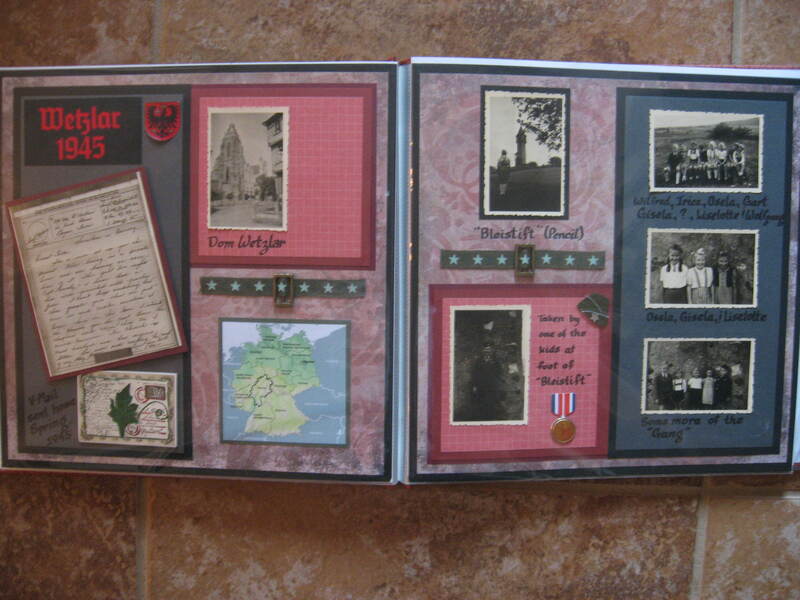 (Note the stamped & embossed medallions on the bottom outside corners of the layout.) She was delighted! What is the poem I wrote for these pages? My mom was 18 when this photo was taken. It was her highschool graduation picture. I have yet to scrapbook this picture and the one below because they are very large. I need to scan them and resize. I have a few other pictures of her in this dress as she stands in the front yard of their house on Old Sycamore street. The house no longer exists. Apartments have taken its place. My grandparents moved from that house when I was very small, but I have fond memories of sitting under the piano and playing with an old doll house. My but that was a very long time ago. My mom is now 90. I am not certain how old my mom is in this picture. I would think that she is probably in her early 20s. 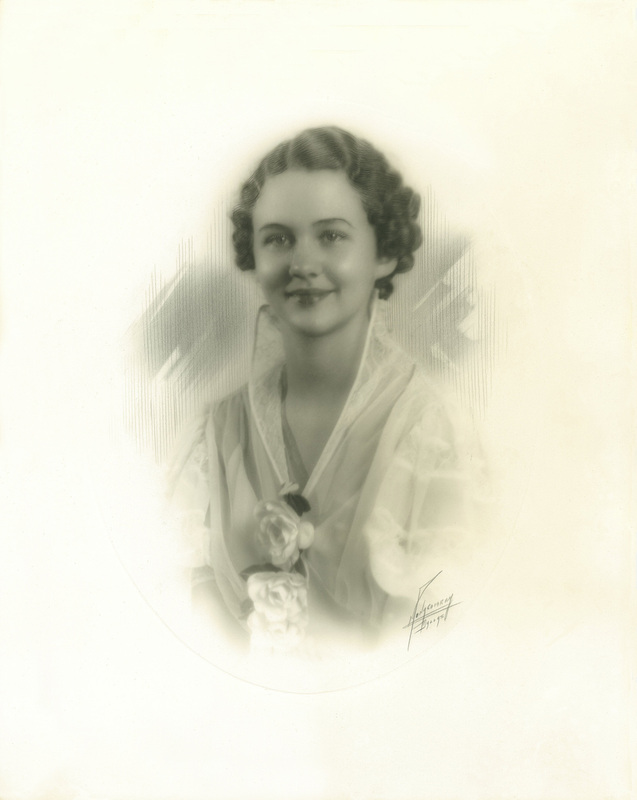 This may have been her graduation photo from the University of Texas. She still has the beautiful golden curls from when she was little. 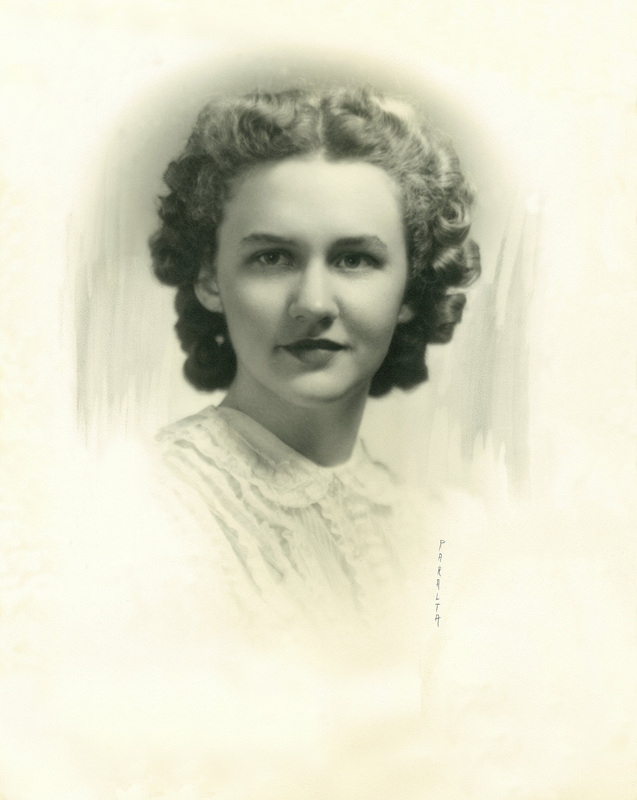 For several years, Mama worked with Catholic Charities. Then she married my dad and started a family. With 6 of us, Mama was a very busy lady. Three of the six inherited the curls although I was the only goldilocks. A number of years back, I put this photograph next to my face as I looked in the mirror and was surprised at the resemblance. 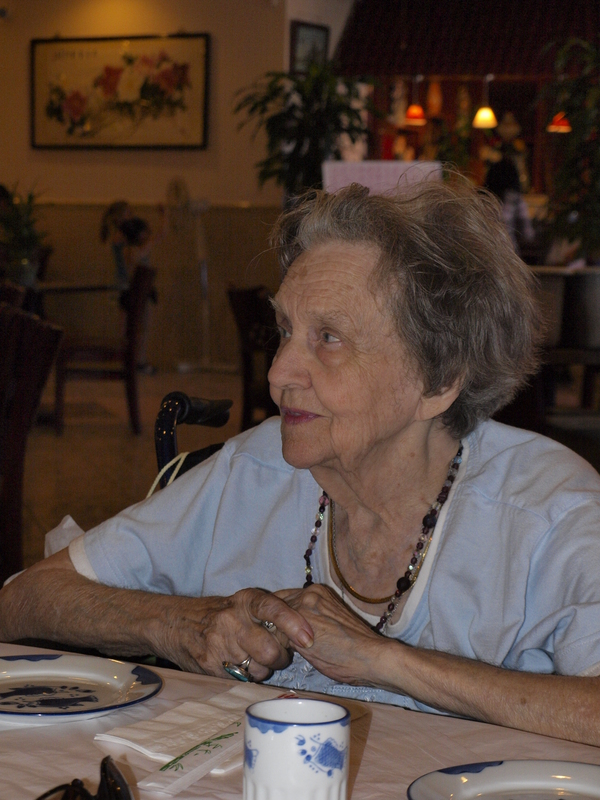 Finally, here is my mom on Father’s day, 2009. Though she has lost the gift of youth, her beautiful spirit remains. She and my dad have been married almost 70 years. What an example to her children and grandchildren! All six girls are married and remain with their partners. What a gift in this day of divorce and dysfunction! Marriage is meant to be a reflection of the relationship within the Trinity. That bond of love is unbreakable. As society comes to see marriage as a secular institution, the image of the Trinity is distorted and disfigured. Jesus’ first miracle was performed at a wedding feast in Cana in Galilee. His Mother told the waiters to do whatever Jesus told them. Mary’s advice to us is the same: “Do whatever He tells you.” What was Jesus’ teaching on divorce? It seems that hardness of heart has spread throughout our society. I pray that a Culture of Life prevails – that we see a renewal of our hearts and minds to the teachings of Christ. Today at Mass, the Gospel reading was from Luke 20. Jesus tells the Sadducees that their interpretation of scripture is wrong concerning the resurrection from the dead. He tells them that our God is a God of the living, not of the dead. He refers to Moses statement that the God of Abraham, the God of Isaac and the God of Jacob is one and the same. He is the Great I AM. All time is at His fingertips for after death to this world, there will be no need for time as we know it. God IS and that is what matters. What is the message here for those faithbook pages we create of family members who have passed from this world? This world is NOT the end! But how we live our lives is important in how we attain the next. The Old Testament reading was from the 2nd book of Maccabees. It was the story of the mother whose seven sons were tortured for their faithfulness to God. It wasn’t really about not eating pork, but about their willingness to sacrifice when it came to being faithful to God or saving their own lives. We can learn from this story. My Paternal Grandfather sacrificed a life he knew in Norway to come to this country. 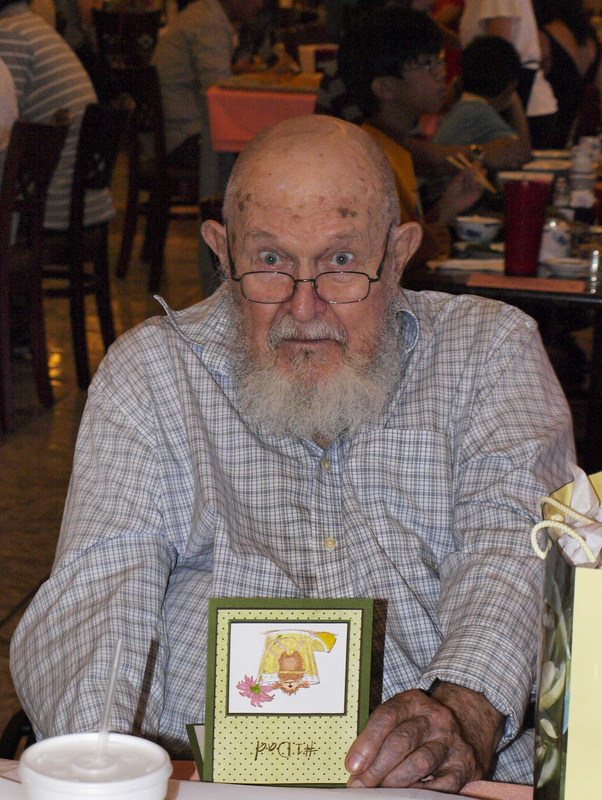 He was eleven years older than my Grandmother and I never knew him as he passed away before I was ever born. But I am certain that he believed his sacrifice was worth it. Had he not come to this country, he never would have met my Grandmother and my Dad would never have been born. I will fill in the blank sections with reflections from this blog post. 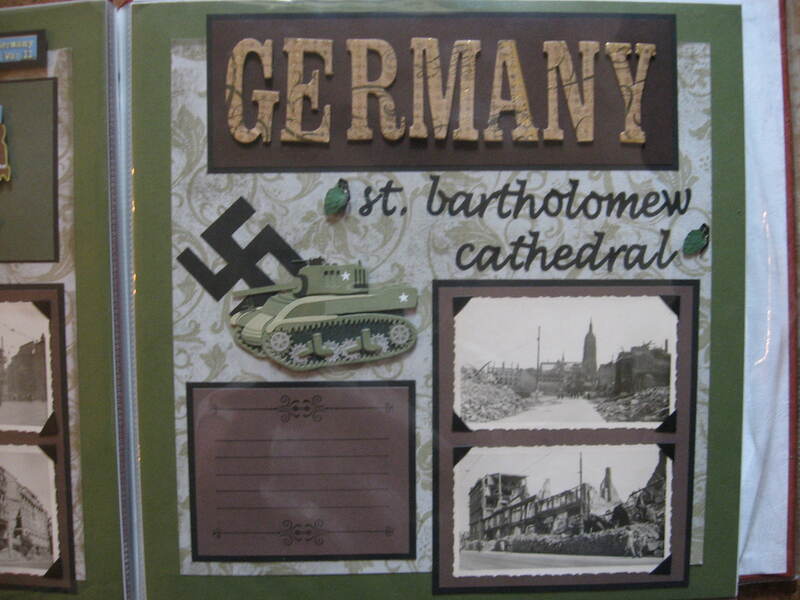 I loved the beautiful papers used for this layout. The green speaks of the life my Grandfather left in Norway and the new life he created with my Grandmother here in the US. My Grandmother was Czech and I remember her kolaches well. 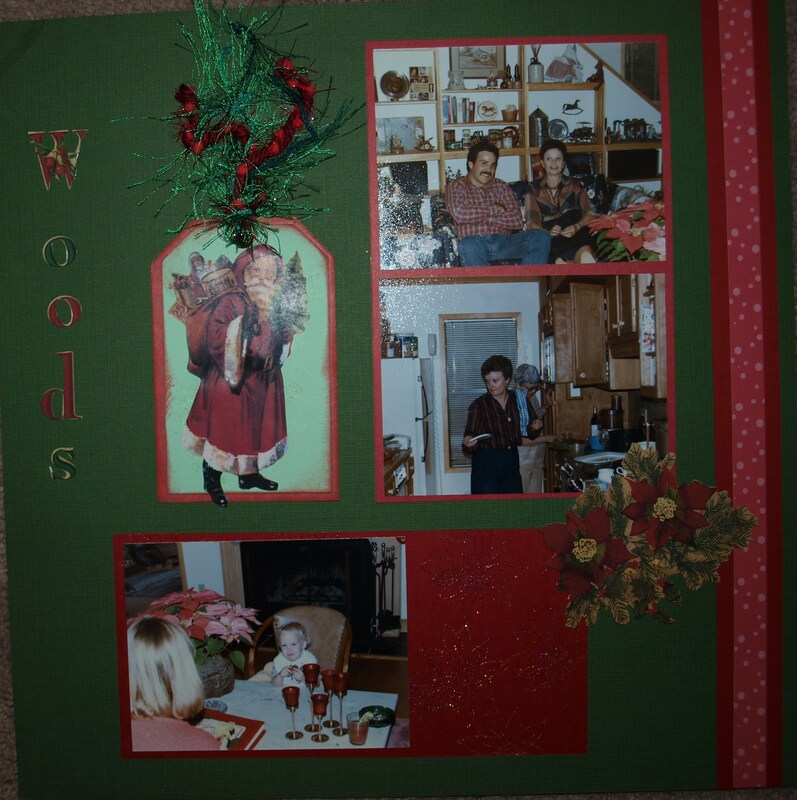 She was a woman who loved to be creative and she passed that on to my Father and my Aunt. 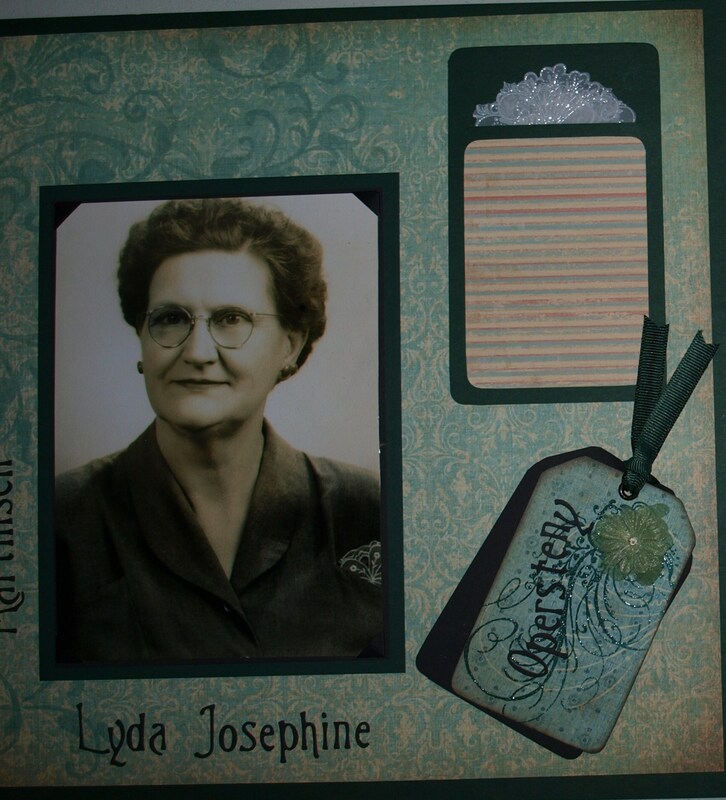 The tag with her maiden name is covered with a stamp of a beautiful flourish. It complements the stamp I used to mimic her handkerchief in the journal box. The mock kerchief was made from embossed vellum. The stamp just happened to be similar in pattern to the embroidery on her handkerchief. My Grandfather owned a construction company. Back in those days, the sons learned from their fathers the family business. What my Dad learned from my Grandfather was priceless. Not only did he learn the art of carpentry and construction, my Dad became a man with tremendous pride in his heritage and a life ethic that moves me to this day. 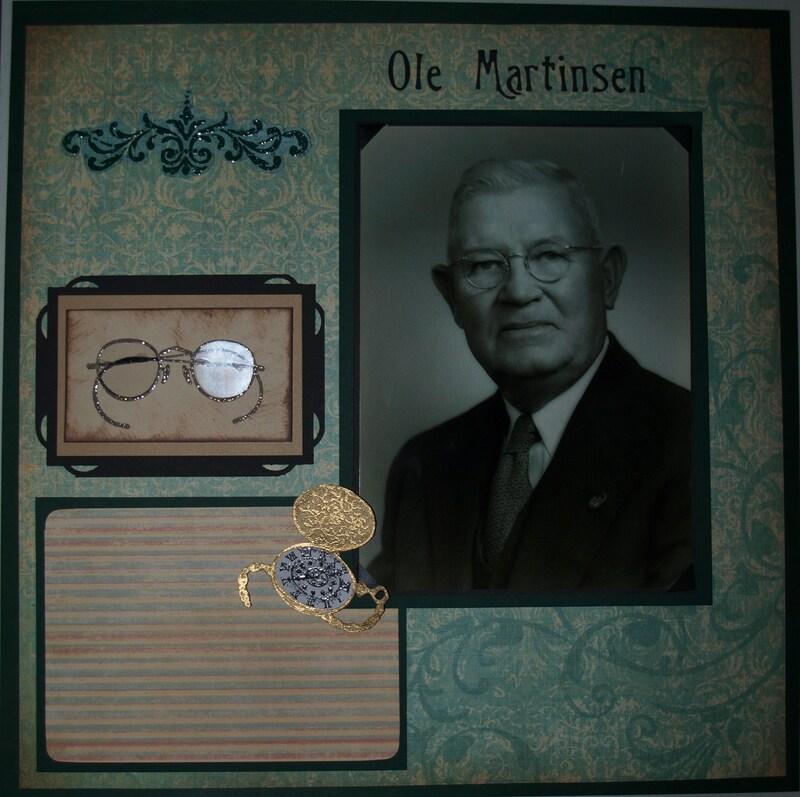 The old eyeglasses remind me of my own father’s eye for detail and beauty. The old timepiece reminds me that my Dad made all his daughters a Grandfather clock as a wedding gift. It wasn’t the clock that meant so much as the time and love he put into making each one. My Dad is truly a #1 Dad. 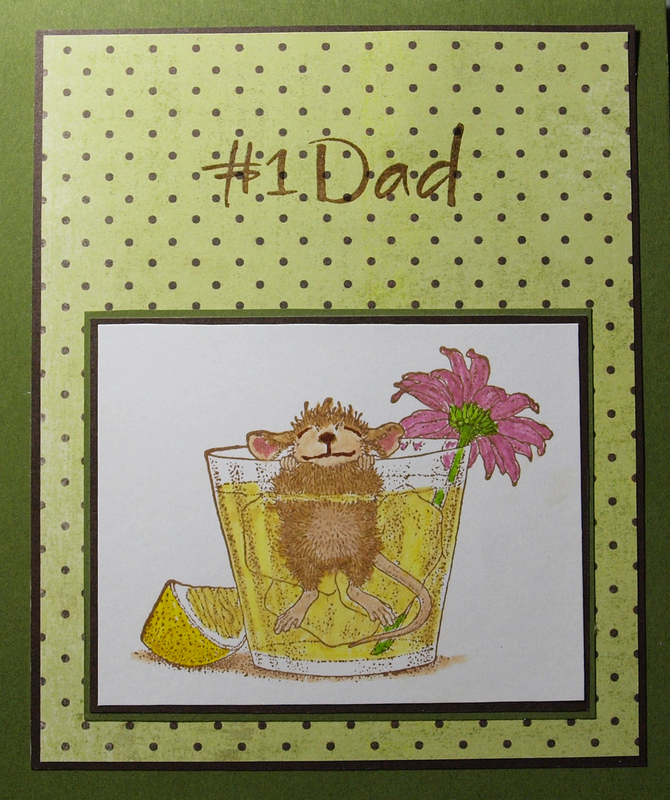 I made him this card for Father’s Day in 2009. I loved the image of the mouse in the lemonade. On the inside of the card, I told him that he taught me one of life’s greatest lessons: “When life gives you lemons, make lemonade!” It has been one of his themes in his old age. Daddy suffers from advanced Parkinson’s. The disease has altered his looks on the outside, but inside he is that incredible man I know as “My Dad”. The God of my Paternal Grandparents is the God of my Father and my God as well. Each generation lives on in the next. I know that one day, I will be proud to meet my Grandfather who helped shape the man my dad is to me. But on that day, I will know truly my Father in Heaven Who gave both these men and my Grandmother the many gifts they have shared with the world. 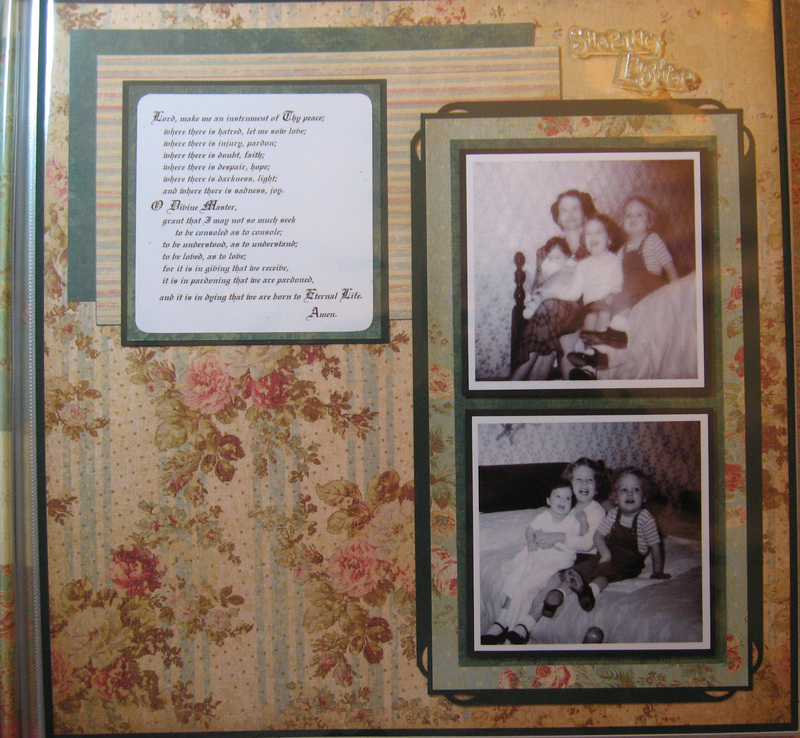 Since Christmas is just around the corner, it might be nice for you to have some new ideas for your scrapbook pages. When I started scrapping, I didn’t have a style and some of my pages were pretty primitive. Over time, my scrapping has taken on a style of its own. 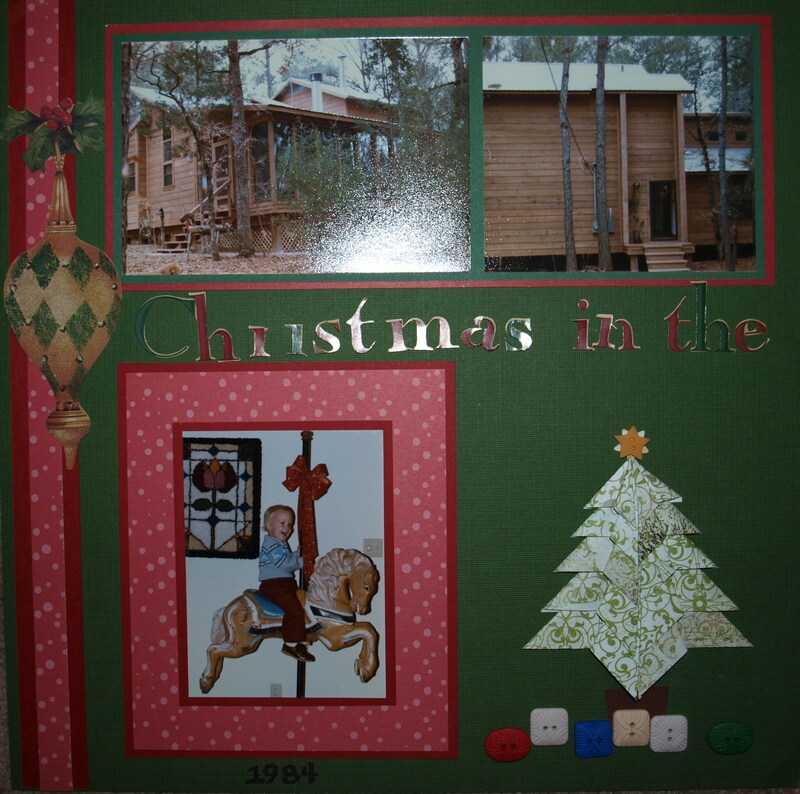 Since I didn’t start scrapbooking until several years ago and faithbooking came after that, I started by getting most of the family Christmases done all at once. Only my later pages have the hint of faithbooking, but you will see the progression. Although I didn’t start chronologically, I did most of the pages by decade at one time, starting with the ’80s when my boys were small. I have to admit that as I’ve grown in the art, I learned to use LOTS of paper, but other scrappers tell me that is what they like about my style. I make the pictures POP and tell the story. Even some of my earliest attempts used layers of paper to frame a photo, but I was still learning about different uses of ink. 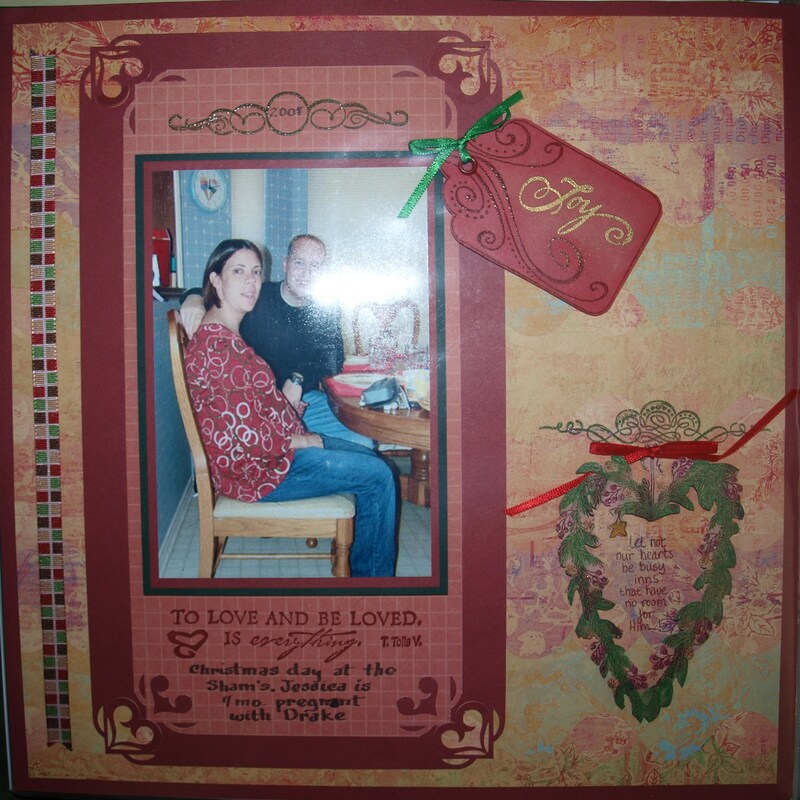 The layout below shows how I used embossing, but little else. It is interesting that as my faith grew, so did my faithbooking. My earlier pages pretty much showed where my faith stood at the time. Although I have always gone to Church at Christmas, in these pages there is little reference to the “Reason for the Season”. Only the tag hints with the saying, “Wise Men Still Seek Him”. I don’t think this was the first set of pages I scrapped for the ’80s. 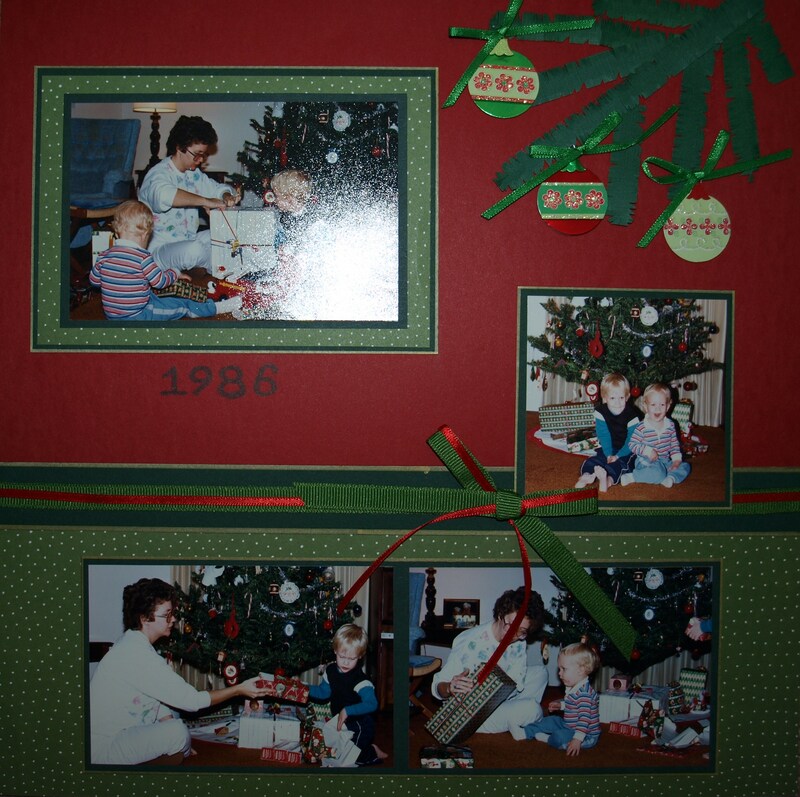 Page 1 – Christmas 1984: the top photo was taken on Christmas Eve at the house of my in-laws. 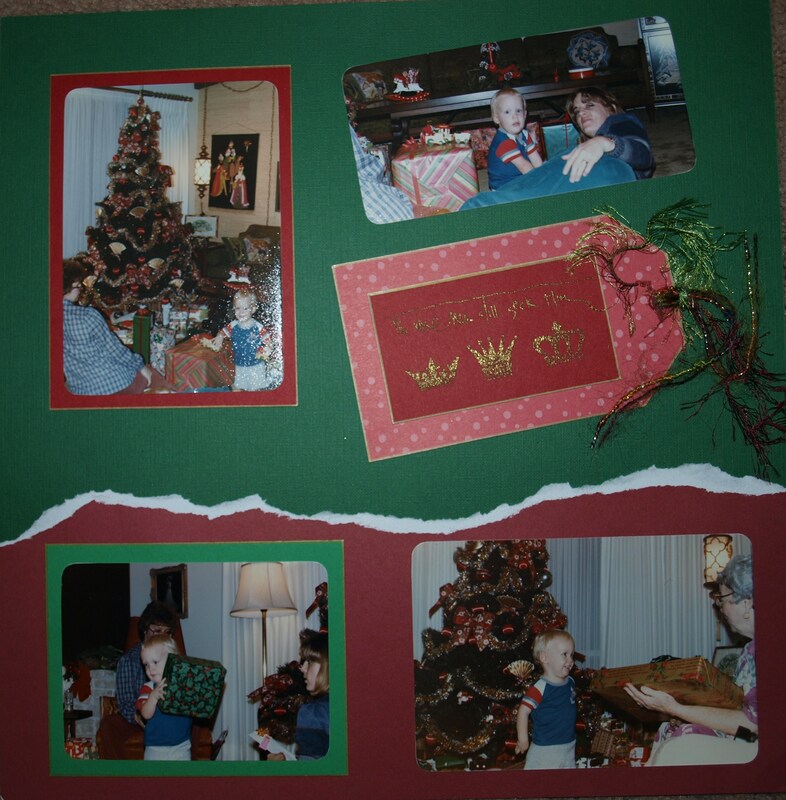 The ones in the bottom section were Christmas morning at home of first son’s 2nd Christmas. 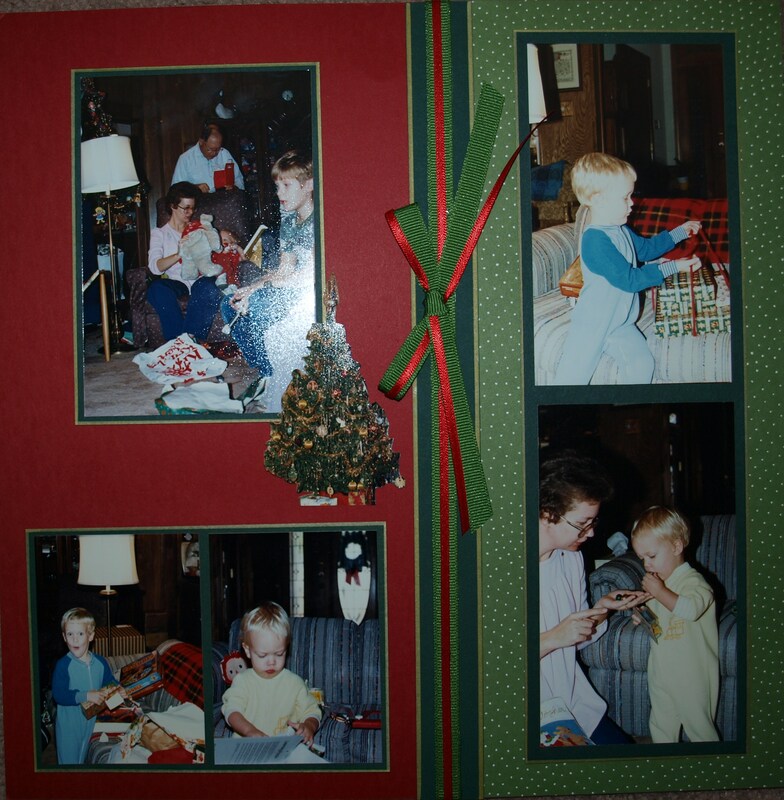 He is in my lap in the 2nd photo and I was pregnant with Chris. 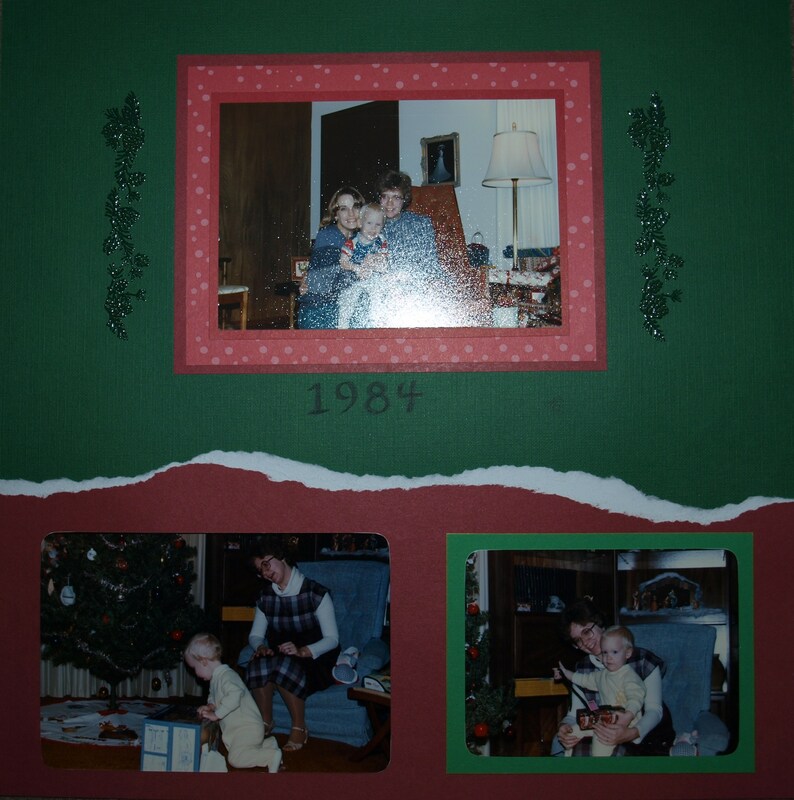 Page 2 – Christmas 1984 photos all taken on Christmas eve. Page 3 – Christmas 1984 photos taken Christmas day in the home of a family friend. It was truly a Christmas in the woods. You can see I was working on new techniques. I found out how to make an origami Christmas tree and used square buttons for packages under the tree. I evidently was only getting the photos into the book when I scrapped 1984 and 1986. I actually payed no attention to faith in those pages. I was just trying to play catch-up on all those years. After all, my boys were already grown when I started and I was way behind. Page 1 – Christmas 1986 taken at home before going to visit family. My two sons open gifts. I am pregnant with my third child. Instead of a whole Christmas tree, I put a branch on the page with ornaments. Decorating the tree has always been a special part of the Christmas preparations for me. O.K. 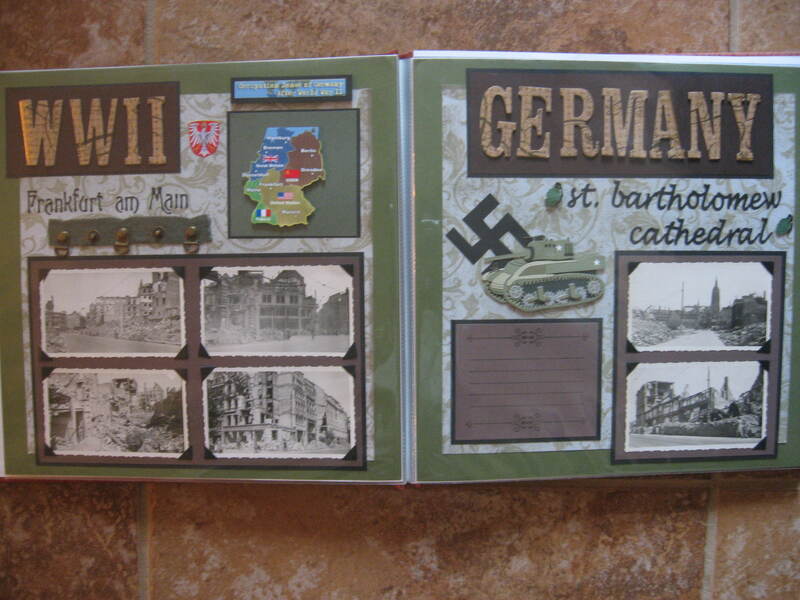 Compare the style of those pages to the next four from 2007. There is a HUGE difference both in style and content. Although only the second set contain the faith in faithbooking, they complete the whole effect for the year of 2007. Take a peek. 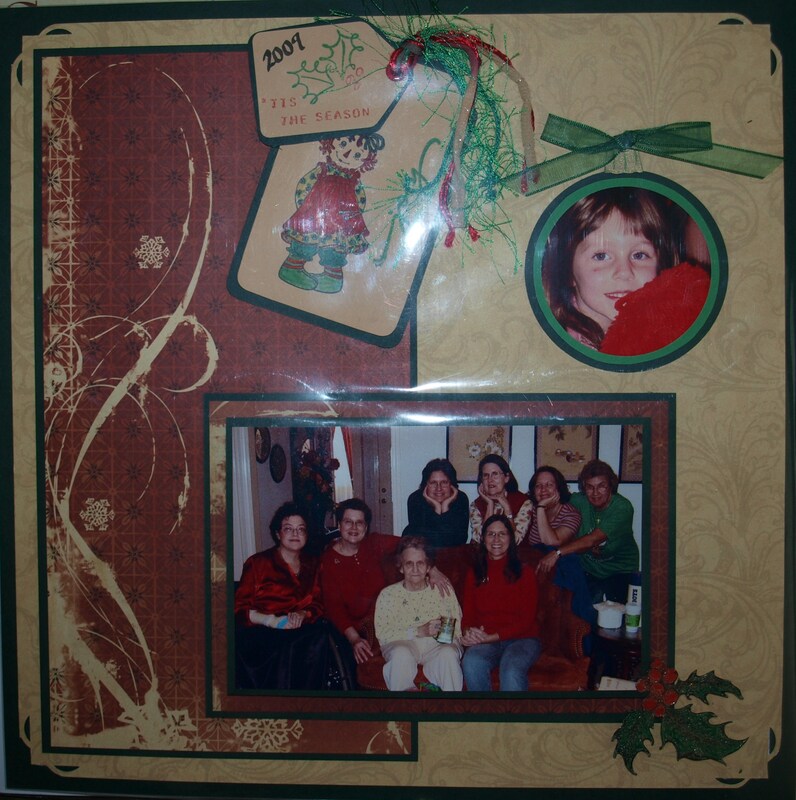 Page 1 – Traditional Christmas (2007) group photo of the sisters and my niece. The circle photo is of my great-niece with her new Raggedy Ann given to her by one of my sisters. 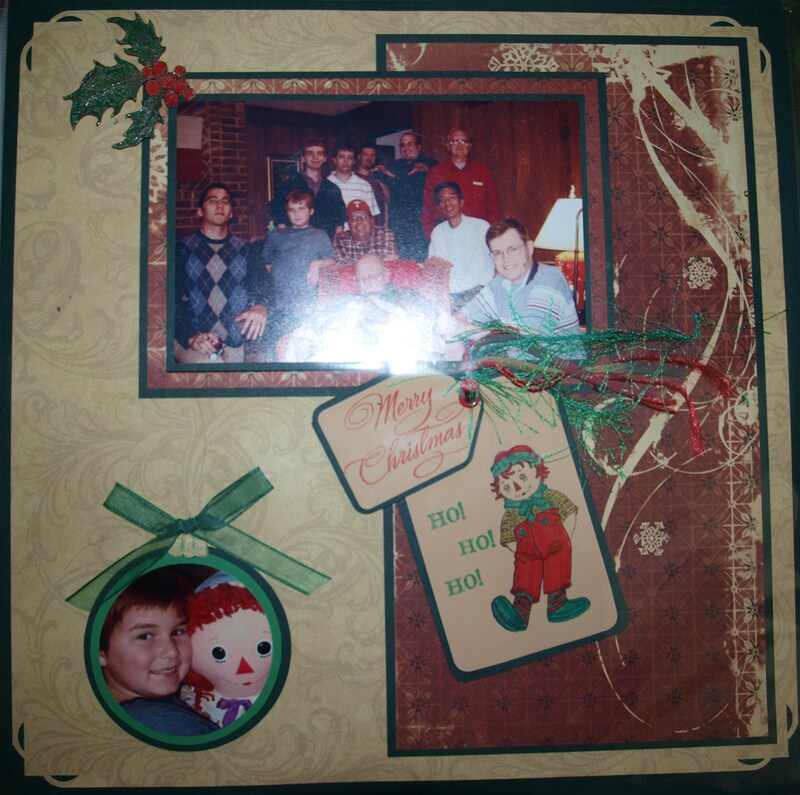 Page 2 – Traditional Christmas (2007) group photo of the “outlaw” brothers and some of the nephews. 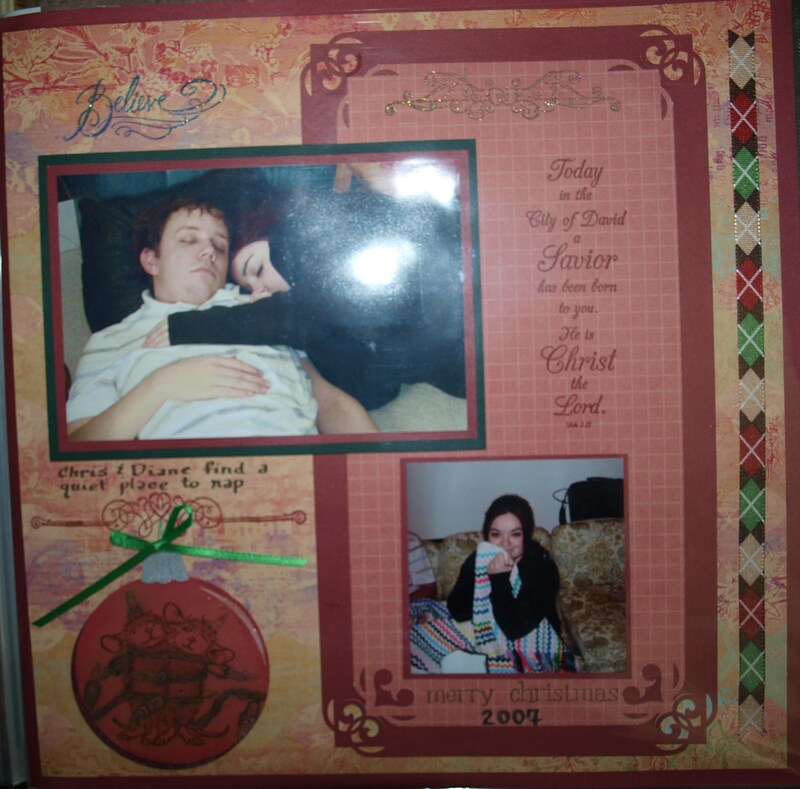 The circle photo is my great-nephew with the Raggedy Andy he got from one of my sisters. Faithbooking, for me doesn’t get any better than including a prayer or a verse from Scripture. This layout has both. It’s one of my favorites!